A rapid, specific, and sensitive method has been developed using molecularly imprinted polymers (MIPs) as solid-phase extraction sorbents for extraction of trace tetracycline antibiotics (TCs) in foodstuffs. MIPs were prepared by precipitation polymerization using tetracycline as the template. Under the optimal condition, the imprinting factors for MIPs were 4.1 (oxytetracycline), 7.0 (tetracycline), 7.4 (chlortetracycline), 7.7 (doxycycline), respectively. Furthermore, the performance of MIPs as solid-phase extraction sorbents was evaluated and high extraction efficiency of molecularly imprinted solid-phase extraction (MISPE) procedure was demonstrated. Compared with commercial sorbents, MISPE gave a better cleanup efficiency than C18 cartridge and a higher recovery than Oasis HLB cartridge. 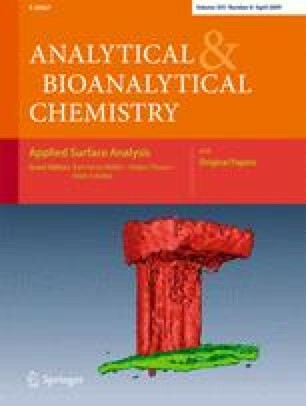 Finally, the method of liquid chromatography–tandem mass spectrometry coupled with molecular-imprinted solid-phase extraction was validated in real samples including lobster, duck, honey, and egg. The spiked recoveries of TCs ranged from 94.51% to 103.0%. The limits of detection were in the range of 0.1–0.3 μg kg−1. This work was supported by the National Nature Science Foundation of China (grant no. 20407009, 30771807) and the Entry–Exit Inspection and Quarantine Bureau of PRC (grant no. 2006IK152).